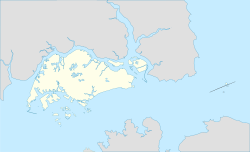 Punggol (Chinese: 榜鹅, Tamil: பொங்கோல்), alternatively spelled as Ponggol, is a planning area and new town situated on the Tanjong Punggol peninsula in the North-East Region of Singapore. The town directly borders Sengkang to the south and shares riverine boundaries with the planning area of Seletar to the west and Pasir Ris to the east. Bounding the town to the north and north-east is the Straits of Johor, with Coney Island included as a part of the Punggol planning area. 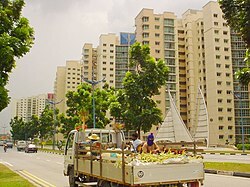 Under the Punggol 21 initiative, plans to turn the area into a new residential town were announced in 1996 and development of the town started in 1998. Due to the Asian financial crisis in 1997 and the financial troubles within the construction industry in 2003, the plan did not fully materialise. In 2007, a new initiative, the Punggol 21-plus plan, was introduced to redevelop the area into a waterfront town. 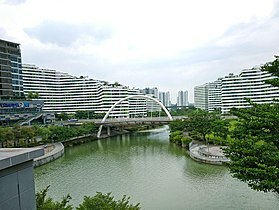 Punggol is divided into 7 subzones, namely, Coney Island, Matilda, Northshore, Punggol Canal, Punggol Field, Punggol Town Centre and Waterway East. Punggol Point or Tanjong Punggol appears as Tanjong Rangon on Franklin and Jackson's 1828 map of Singapore. Punggol, also spelled Ponggol, means "hurling sticks at the branches of fruit trees to bring them down to the ground" in Malay. It could also refer to a place where fruits and forest produce are offered wholesale and carried away. These possible names indicate that Punggol was a fruit growing district. The place is said to take its name from the river Sungei Ponggol. Ponggol also means "a stump of a tree", especially "a high stump". There are suggestions that the word is Tamil (Pongal, "the feast of the boiling rice", is celebrated when the sun enters the sign of Capricorn). However, the word Ponggol or Punggol is definitely Malay. 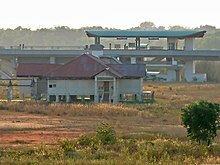 The Punggol West LRT is located in relatively undeveloped surroundings in 2006. As of 2015, one can no longer view the LRT Station directly from this point of view. The plain area with Matilda House shown here, has been developed into new HDB flats and condominiums. Located in the vicinity of the Punggol Jetty, Punggol was believed to have existed 200 years ago before Sir Stamford Raffles founded Singapore. The Punggol area used to be a well-established rural district dotted with farmhouses and farm structures, which were serviced by roads and dirt tracks. It was one of the oldest settlements in Singapore. The original settlers were predominantly Malays. The early Chinese immigrants, who settled in Punggol from the mid 19th century onwards, were engaged in plantation work, mainly rubber. As the population of the Chinese increased, many Chinese villagers were then engaged in poultry, pig or fish farming, as well as farm produce. The last pig farm closed down in 1990. Hydroponic non-pollutive vegetable farms and orchid farms used to flourish along the Cheng Lim Farmways and Buangkok Farmways, along with old kampongs and low-rise residential areas. Most of these farms have given way to the high-rise HDB flats of Sengkang New Town and Punggol New Town. Historically, Punggol was populated mostly by Teochews and Catholics. However, the original settlers were predominantly Malays. The end of Upper Serangoon Road is known to Teochews as kangkar or "river bank" or "river mouth". Ferries were used on the Serangoon River as transport. An old market was also located here. The Catholic missionaries arrived here 140 years ago and set up churches and schools. A Malay kampong, which has since been cleared, could also be found at Tanjong Punggol. At the end of Punggol Port Road, Indonesian and Malaysian fishermen auctioned their catch at the wholesale fish market. During the Second World War in 1942, about 400 Chinese civilians were massacred by the Japanese military forces at Punggol Point, the northern tip of the area, in what was to be known as the Punggol Beach Massacre as part of the Sook Ching massacre during the Japanese Occupation of Singapore. Today, that location has been marked as a national heritage site, and a war memorial now exists at the area. In the 1960s, basic amenities like piped water, electricity, paved roads, and drainage systems were introduced through government and self-help programmes. It was also at this time that television became popular and antennas could be seen installed on many kampong rooftops. Punggol was also known for its sumptuous seafood and boatels that provided services like docking and renting of boats for boating, water skiing and skindiving lessons. These seafood restaurants and boatels have since been relocated in the mid-1990s to facilitate land reclamation works. Poultry and pig farms were also gradually phased out when redevelopment commenced in the 1970s. The last pig farm closed down in 1990. Land vacated by resettled farmers were then tendered out on short term leases for non-pollutive agricultural activities, which included hydroponic non-pollutive vegetable and orchid farms that used to flourish along the Cheng Lim Farmways and Buangkok Farmways. These farms existed along with old kampongs and low-rise residential areas. Most of these farms have given way to the high-rise HDB flats of Sengkang New Town and Punggol New Town. In his National Day Rally speech on 18 August 1996, then-Prime Minister Goh Chok Tong announced the Singapore Government's plan to develop Punggol, known as "Punggol 21". Punggol 21 was a new model for housing, which would feature a new concept in housing as a model for new towns in the 21st century. It would have a mix of private houses, executive condominiums, and high-grade HDB flats grouped into smaller, distinctly designed estates. Each estate would contain between 1,200 and 2,800 units, with a common neighbourhood green. Every housing unit would be located within 300 metres of the nearest LRT station. Schools, libraries, and community clubs would be clustered for convenience, and there would be three commercial centres, including shopping centres. A few months after the speech, Punggol 21, which was part of Cheng San Group Representation Constituency then, became an election carrot for the People's Action Party (PAP) to beat a Workers' Party team led by J.B. Jeyaretnam and Tang Liang Hong. At the general election in 1997, the five-man PAP team managed to retain Cheng San GRC with 54.8% of the valid votes. However, Punggol 21 did not materialise fully as Singapore's economy was affected by the Asian economic crisis in 1997. Although construction began the next year, it was stopped when demand for new flats fell sharply. Plans were again delayed when the construction industry in Singapore experienced financial troubles in 2003. As a result, only some 16,000 flats, out of the 80,000 planned units, have been built as at 2007. There was only one shopping mall in the estate, Punggol Plaza, and there were no recreational facilities like cinemas or swimming pools. As of January 2016, a second shopping mall in the estate, Waterway Point, has opened, and recreational facilities have since been planned within the estate. 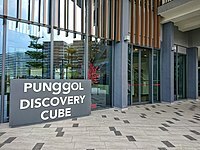 The Punggol Discovery Cube is a visitor's centre for residents and visitors to learn about Punggol's history. In his National Day Rally speech on 19 August 2007, Prime Minister Lee Hsien Loong offered a new vision for Punggol New Town, and introduced the "Punggol 21-plus" plan to re-vitalise the town. Under the new plan, Sungei Punggol and Sungei Serangoon, which flank the town, will be dammed up to create a freshwater lake and serve as a reservoir. 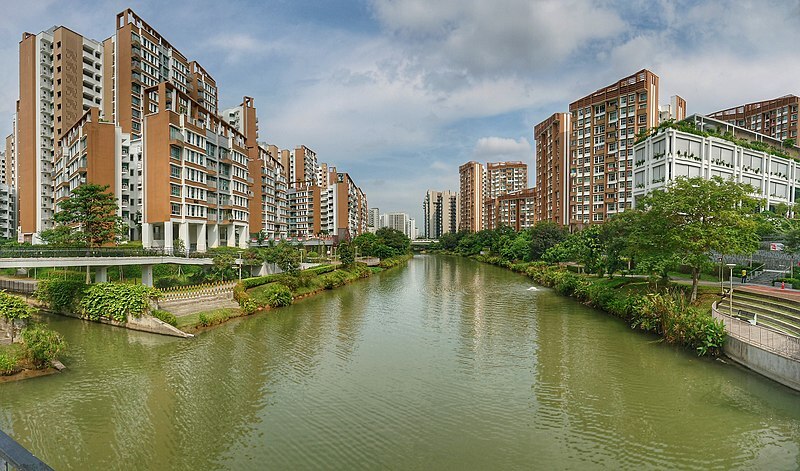 A 4.2-kilometre long, 20-30-metre wide man-made waterway will run through the estate, linking both rivers. Work on it will start in 2009, and had been completed on 26 October 2011. When built, there will be recreational facilities like water sports for kayaking and canoeing, gardens and parks with jogging and cycling tracks, rooftop gardens, eateries for al fresco dining and a floating island. The "Punggol 21-plus" project involves 18,000 new HDB and private flats, and about 3,000 new flats will be built in Punggol New Town every year. Punggol New Town is projected to have 96,000 units when fully developed in the long term. Waterfront housing will have stepped courtyards. There will be a promenade on the northern sea front, stretching about 8.7 km. An integrated waterfront commercial and residential development has also been planned at the town centre, which will be built on both banks of the waterway. The site for this project was put up for sale and named Waterway Point with condominium – Watertown. There will also be other facilities within the town centre, which includes a community club, regional library and hawker centre in the future. Punggol Central will be converted into a tree-lined boulevard with landscaping. Coney Island, on the other hand, was opened to the public in 2015. Waterway View is one of the newer waterfront housing estates under the "Punggol 21-plus" project. Urban development into the area has been accelerated with the introduction of better transportational options. The Tampines Expressway (TPE) links Punggol New Town up with Singapore's expressway network. The Kallang-Paya Lebar Expressway, which provides a direct route to the city area via TPE, was fully opened in September 2008. New roads were also built to ease traffic congestion on Punggol Road. In terms of public transport, the opening of the North-East line on 20 June 2003, the Punggol LRT Line (East) on 29 January 2005, and the temporary Punggol Bus Interchange adjacent to the Punggol MRT station on 30 November 2003, The S$1.9-million temporary Punggol Bus Interchange, which took 10 months to construct, was opened on 30 November 2003 by Member of Parliament for Pasir Ris-Punggol GRC Teo Chee Hean while the West Punggol LRT Line was opened, with the last 3 stations (Nibong, Sumang and Soo Teck) currently in operation, on 29 June 2014. As of April, Sam Kee has also opened up, allowing residents to go to the new Punggol SAFRA Club. This is a large improvement over what was once only a single bus route, SBS Transit (now operated by Go-Ahead Singapore)'s Service 82, which used to serve the area along Punggol Road. In 2017, it was announced that an additional station on the North East line, Punggol Coast, would commence operations in 2023, serving commuters in Punggol North. Strategically located near Coral Edge LRT Station, Punggol Plaza is the first shopping mall in Punggol New Town. Opened in September 2004, it offers residents the convenience of fulfilling all their marketing needs at one place, with an NTUC FairPrice supermarket located on the third floor of the plaza and a food court operated by Koufu on the ground floor. Free shuttle services between Punggol Plaza and Sengkang New Town have been provided since September 2004. 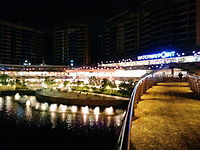 Located beside the Punggol Waterway and Punggol MRT/LRT Station, Waterway Point is the largest mall located in Punggol New Town. It is integrated with a town square and a visitors' centre which provides an avenue for residents and the public to learn more about the heritage of Punggol through exhibitions and civic and community events and also features the first underground and largest suburban cineplex in Singapore. The mall had a soft launch on 18 January 2016, and was officially opened on 19 April 2016. Oasis Terraces as seen from Punggol Waterway in 2018. Oasis Terraces was announced in October 2015 by the Housing and Development Board (HDB) as part of two new neighbourhood centres in Punggol, the other one being Northshore Plaza. Oasis Terraces also houses the Punggol Polyclinic which opened on November 24, 2017, offering outpatient medical care, X-ray, physiotherapy, podiatry services and women health services such as screening for cervical and breast cancer. Located near Punggol Waterway Park beside Sam Kee LRT Station on the Punggol LRT West Loop, the Safra Punggol Clubhouse is a five-storey recreational facility. Announced to be built in June 2014, the clubhouse caters to mainly NS men and their families features an indoor water playground and a large eco-themed childcare centre. Completed in 2016, the clubhouse houses 10 F&B outlets such as themed restaurants, alfresco dining and quick-service outlets. Its other amenities includes a gym, bowling alley and a karaoke outlet.Punggol Safra was officially opened on 24 April 2016. Masjid Al Islah is located within the densely populated Punggol New Town at 30 Punggol Field. The mosque serves the Muslim community in Punggol. The Church of the Transfiguration is the latest Catholic church to be built in Singapore and will serve an estimated 15,000 Catholics and is expected to be one of the largest parishes in Singapore. There are currently nine primary schools and three secondary schools in Punggol New Town. Edgefield Primary School (育德小学) originally opened in January 2001 but could not attract enough students to make even one class. It opened in January 2002. Greendale Primary School (绿苑小学), was one of the six new primary schools built in new housing estates and towns so as to cater to smaller class size. Mee Toh School (弥陀学校) moved from Race Course Road to Punggol New Town in January 2006. Horizon Primary School opened in 2010. Oasis Primary School opened in 2016 along with Punggol Cove and Waterway Primary Schools. Punggol Cove Primary School opened in 2016 along with Oasis and Waterway Primary Schools. Punggol Green Primary School opened in 2013 to serve the Punggol West community. 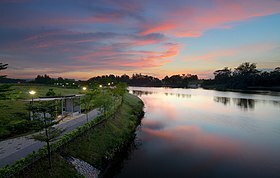 It is located at 98 Punggol Walk, next to Punggol Sapphire and Punggol Ripples. Punggol View Primary School, opened in 2013, operates as a single-session school so as to commit more space and time for holistic education. Waterway Primary School opened in 2016 along with Oasis and Punggol Cove Primary Schools. Greendale Secondary School opened in January 2006. Singapore Institute of Technology (under development). On 23 August 2015, Singapore's Prime Minister Lee Hsien Loong announced in his National Day Rally that SIT will have a new centralised campus in Punggol. The University will be integrated with a creative industry cluster to be built by JTC Corporation, and into Punggol Downtown and the Housing Board's upcoming Northshore district. ^ a b "Punggol (Planning Area, Singapore) - Population Statistics, Charts, Map and Location". www.citypopulation.de. ^ Only two out of the four seafood eateries that operated at the old Punggol Point until 1995 are still around in Singapore: Mak Mun San (26 August 2007). "Punggol revisited". The Sunday Times. ^ Warren Fernandez (19 August 1996). "PM Goh urges young to rally behind him". The Straits Times. p. 1. ^ "Punggol 21". The Straits Times. 19 August 1996. p. 24. ^ a b c d Peh Shing Huei and Lynn Lee (24 August 2007). "The promise of Punggol". The Straits Times. ^ a b c Jessica Cheam (22 August 2007). "Residents look forward to 'Punggol 21-plus'". The Straits Times. ^ a b c Lynn Lee (20 August 2007). "Punggol 21 reborn – and jazzed up as well". The Straits Times. ^ Lynn Lee (20 August 2007). "Big plus for Punggol residents". The Straits Times. ^ a b Jasmine Yin (20 August 2007). "The whole country will be transformed". Today. p. 6. ^ Nazry Bahrawi (21 August 2007). "It's time to dream again...: Value of flats in Punggol will go up as area is developed". Today. p. 3. ^ a b c Tan Hui Yee (1 September 2007). "Punggol perks". The Straits Times. p. H10. ^ "Punggol residents can look forward to more facilities". URA Singapore. 14 August 2014. Retrieved 8 December 2014. ^ "Punggol (Planning Area, Singapore) – Population Statistics and Location in Maps and Charts". City Population (with data from the Singapore Department of Statistics). Retrieved 26 January 2018. ^ "KPE to fully open to traffic this Saturday". Channel NewsAsia. 18 September 2008. ^ Karamjit Kaur (21 December 1999). "New roads cut down travel time". The Straits Times. p. 40. ^ Goh Chin Lian (21 June 2003). "It's a smooth ride on NEL – mostly". The Straits Times. ^ Leonard Lim (21 June 2003). "NEL gets off to a promising start". The Business Times. ^ The west loop of the Sengkang LRT Line opened on the same day: Christopher Tan (11 January 2005). "Punggol LRT set to roll". The Straits Times. ^ The S$1.9-million temporary Punggol Bus Interchange, which took 10 months to construct, was opened on 30 November 2003 by Member of Parliament for Pasir Ris-Punggol GRC Teo Chee Hean "Punggol residents get bus interchange". The Straits Times. 1 December 2003. ^ "Punggol residents get bus interchange". The Straits Times. 1 December 2003. ^ "Punggol West LRT System to Commence Passenger Service and North East Line to Add More Train Trips". SBS Transit Press Release. SBS Transit. Retrieved 29 April 2016. ^ Mokhtar, Faris (7 June 2017). "Punggol Coast MRT Station to open in 2023, 7 years earlier than planned". Today. Retrieved 30 March 2018. ^ Goh Chin Lian (4 November 2004). "A mall in Punggol ...at last". The Straits Times. ^ "Shaw's Waterway Point cineplex has most screens in the heartlands". The Straits Times. 21 January 2016. Retrieved 21 January 2016. ^ "Why Waterway Point is anchored for success". The Edge Property. 22 January 2016. Retrieved 25 January 2016. ^ "Waterway Point officially opens". Channel NewsAsia. 19 April 2016. Retrieved 20 April 2016. ^ "HDB unveils next-gen neighbourhood centres in Punggol, Hougang and Sembawang". The Straits Times. 3 October 2015. Retrieved 3 September 2018. ^ "New polyclinic in Punggol to offer physiotherapy, podiatry services". Channel NewsAsia. 22 November 2017. Retrieved 3 September 2018. ^ "New waterfront Safra club in Punggol: 5 things about the $57.3m club". The Straits Times. 18 June 2014. Retrieved 8 December 2014. ^ Tee Hun Ching (24 September 2000). "Life behind the vales". The Straits Times. ^ Sarah Ng (17 April 2005). "Plan for six new primary schools by 2008". The Straits Times. ^ 王珏琪 (1 August 2007). "家长对"未来学校"有信心, 明年才开班, 崇辉受欢迎 (in Mandarin)". Lianhe Zaobao. Archived from the original on 29 October 2007. Retrieved 29 September 2007. ^ "Mee Toh School to move to Punggol". The Straits Times. 24 May 2004. ^ "Punggol Green Primary School". Punggol Green Primary School. 1 January 2013. Retrieved 18 June 2013. ^ "Greendale Secondary School: History". Greendale Secondary School. 2007. Archived from the original on 11 September 2007. Retrieved 7 September 2007. ^ was the new name of Pei Dao Secondary School when it was relocated to Punggol New Town in 2001: "Punggol Secondary School: History". Punggol Secondary School. 2005. Archived from the original on 25 August 2007. Retrieved 7 September 2007. ^ "SIT to have new centralised campus in Punggol". Asiaone in August 2015. ^ "National Day Rally 2015: Singapore Institute of Technology's new central campus to be housed in Punggol". The Straits Times in August 2015. ^ "NDR2015: SIT to get a new centralised campus". Channel NewsAsia in August 2015. Victor R Savage, Brenda S A Yeoh (2003). Toponymics – A Study of Singapore Street Names. Singapore: Eastern Universities Press. ISBN 981-210-205-1. "Transcript of Prime Minister Lee Hsien Loong's National Day Rally English Speech on 19 August 2007 at NUS University Cultural Centre". Ministry of Information, Communications and the Arts. 19 August 2007. Archived from the original on 27 September 2007. Retrieved 2 September 2007. 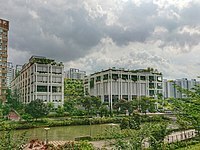 Wikimedia Commons has media related to Punggol.